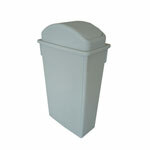 The trash can is durable and easy to use. The handles provide easy handling and the flat bottom provides stability. Lids have secure snap and easy to lift open. The trash can dollies are great for transporting heavy loads. Lids and dollies are sold separately.